I'm not a makeup expert and I don't wear a lot of makeup. If I do it's only for my eyes and my lips. I'm a simple kind of girl, plus it's too much work for me. So I commend all of you who use primer, foundation and contour! I give you girls and guys props for that. 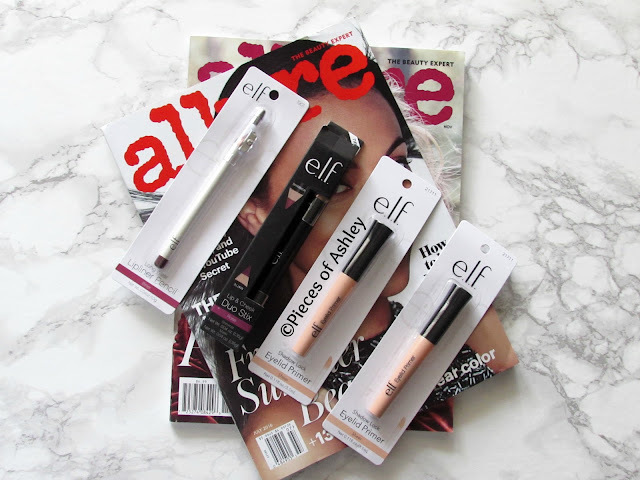 In the past I talked about how much I love elf cosmetics, second to BH Cosmetics though! They are both affordable plus their good quality! So here's a small haul of the things I brought from elf. These purchases were a couple of weeks apart. Both of these purchases also included free shipping with no minimum. I jumped on this opportunity quick. There's only two eye primers I like and that's the elf eyelid primer and NYX eyeshadow base. Would you count this base as an eye primer? Anyway, I ran out of this eyelid primer so I brought two. It only costs $2 each so if I ran out I can move on to the next one. The color comes in sheer, but it won't affect how your eyeshadow looks. When I first tried this I worried about this. But it does not make a difference at all. Fall is here and I love dark purples and reds. So I cannot wait to try this lip liner in the color bitter. It looks burgundy but I will have to swatch and actually see it. This lip pencil glides on to prep the lips for color. The pro vitamin complex included helps gently lock in rich, natural looking lip color. I'm really excited to try this out. Until recently when reading a few blogs, I didn't know anything about a lip & cheek duo stick. I love how one side provides a shimmer look and the other a matte look. It gives you the option of what you want to wear that day. So I can't wait to try this! I hope you enjoyed reading and if you have any new items I should check out, let me know!